It may have been two nights ago, but the emotion and legacy are already hitting most viewers like a ton of 53rd street bricks as David Letterman’s last broadcast of The Late Show came to a close this past Wednesday evening. One of Letterman’s favorite bands, The Foo Fighters, returned to close out the final show with Everlong, a song they played for Letterman back in 2000 when he was recovering from open heart surgery. Having worked for David Letterman for almost a year, I met many amazing people including President Obama, Bill Clinton, Paul McCartney, and everyone in between. But seeing the Foo Fighters perform twice while working there was truly something I will never forget, so this last performance definitely holds a special place in my heart. 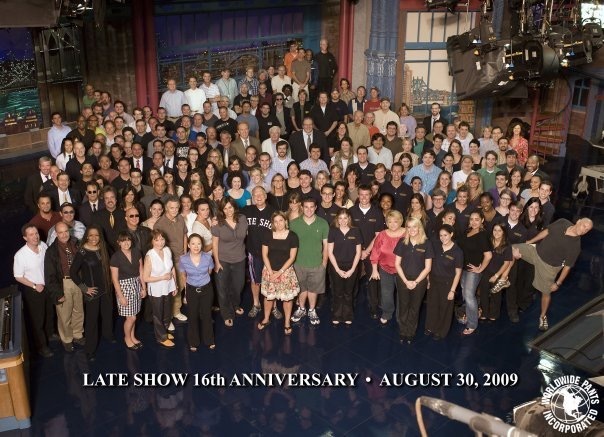 Below is our staff photo from 2009, months prior to my emotional departure from the show. Brownie points for the first to comment in the ‘comments’ section below of where they spot me. Can you spot Rogue Planet’s Ryan Sprague in this staff photo? What did you think of the final show? Let us know below, and watch the emotional version of Everlong! Foo Fighters Surprise NYC Audience with Influential Punk Band!